PRD electoral color is white but in the diagram is shown as blue. FA run allied with PRM but act as independent. The Chamber of Deputies (Spanish: Cámara de Diputados) is the lower chamber of the Congress which, along with the Senate, composes the legislature of the Dominican Republic. 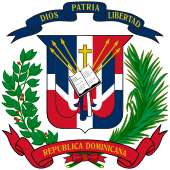 The composition and powers of the House are established by Constitution of the Dominican Republic. The Chamber is composed of deputies who are divided in 178 by province, five nationally, and seven overseas. The Chamber is charged with the passage of national legislation, known as laws, which, after concurrence by the Senate, are sent to the President of the Dominican Republic for consideration. In addition to this basic power, the Chamber has certain exclusive powers of which include the power to initiate all laws related to revenue, the Impeachment of officers elected by popular vote, the Senate or the National Council of the Magistracy who are sent to trial the Senate. On May 15, 2016, 190 deputies were elected, including 178 by provincial districts, five by national at-large voting, and seven by Overseas Deputies. It includes 5 national and 7 overseas deputies. In 2010, the deputy Virgilio Meran Valenzuela win his seat like a member of MODA, but due to personal political changes, the web page of the Chamber of Deputies of the Dominican Republic, list him like a PRD deputy. Moreover, the page not list MODA as a political party with some legislative representative. Senate of the Dominican Republic.